Get ready for the wildest adventure of a lifetime in the most ambitious musical production ever brought to film. Earning a 1967 Academy Award Nomination for Best Picture, this dazzling fantasy turns both ordinary and exotic animals into talking, dancing and singing sensations! Rex Harrison is unforgettable in this inspiring adaptation of Hugh Lofting's classic stories. Step into the English country home of the good doctor as he performs..
Own Doctor Dolittle 3 / Dr Dolittle 4 DVD from Deff, DVD, Blu-Ray & 4K Video Specialists - Free UK Delivery..
Dr. Dolittle: Treat yourself to a healthy dose of Eddie Murphy's untamed animal magnetism in the smash hit comedy! A successful doctor and devoted family man, John Dolittle (Murphy) seems to have the world by the tail, until a long-suppressed talent he possessed as a child - the ability to communicate with animals is suddenly reawakened...with a vengeance! 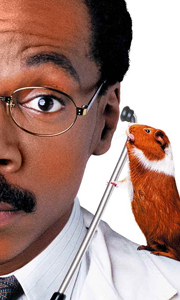 Now every creature within squawking distance wants the good doctor's advice, unle..
Dr Dolittle: A successful doctor and devoted family man, John Dolittle (Eddie Murphy) seems to have the world by the tail, until a long-suppressed talent he possessed as a child - the ability to communicate with animals - is suddenly reawakened. Now every creature within squawking distance wants the good doctor's advice, unleashing an outrageous chain of events that turns his world upside down!Dr Dolittle 2: Dr. Dolittle's ability t..
Superstar Eddie Murphy is back with a hilarious sequel to the blockbuster hit, Dr. Dolittle. Now his ability to talk with the animals lands him in a race against time to turn a circus bear into an irresistible lover, and win the heart of an endangered bear. The future of the forest and his animal friends depends on his success! Dr. Dolittle 2 is a delightful comedy adventure you won't forget. And it's guaranteed to drive your family wil..
Maya Dolittle (Kyla Pratt) just wants to be a normal teenager, but there's one small problem: she's inherited her father's uncanny ability to talk to animals. Her special skill keeps landing her in the doghouse with her parents, and it's driving her friends completely ape! At a summer dude ranch, maya tries to hide her unique talent so she can fit in, but when her friends are in trouble, she comes to the rescue as only a Dolittle can - ..
Maya Dolittle (Kyla Pratt) and her loyal dog Lucky are back, in a heartwarming adventure of presidential proportions! When Daisy, the U.S. President’s dog, starts misbehaving, the Secret Service shows up at the Dolittle home seeking help. With the doctor away, high school senior Maya - who inherited her father's gift for animal speak - is called into action. Now it’s up to Maya and Lucky to stop a canine catastrophe from becoming a majo..